A proposal for a five-story, mixed-used building to replace an auto body shop on Hancock Street will get a public airing at a Boston Planning and Development Agency meeting next week. The development at 233 Hancock St. is being undertaken by ARX Urban, a real estate firm with a history of building workforce housing in Boston. 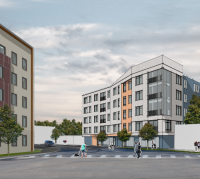 The company hopes to gain approval to construct a 36,160-square-foot building containing 36 residential rental units, 22 parking spaces, 850 square feet of the ground-floor for retail space, and 400 square feet of ground-floor gallery space. ARX Urban’s 233 Hancock LLC purchased the parcel in April for $1.2 million from the trustees of BJ Bros Realty Trust. The property sits at the intersection of Hancock and Pleasant streets, across the way from the forthcoming mixed-use Dot Block project. A pedestrian walkway proposed in the Dot Block development would connect the Hancock/Pleasant intersection to Dorchester Avenue. Apartments are a proposed mix of studios, one-, and two-bedrooms. Of the 36 residential units, five will be made affordable to households earning between 80 percent and 120 percent of the area median income. In their filing with the BPDA, developers said they hope to “revitaliz[e] an industrial parcel” and replace the current automotive repair uses with retail and a gallery. The open lobby and community art gallery would be visible to pedestrians through a glass-fronted first floor. The developers will also create “a more pedestrian friendly Hancock Street by improving the streetscape and widening the sidewalks,” according to the filing. The developers highlighted the value of the Savin Hill T station less than half a mile from the site, and mentioned a plan to encourage residents to use first-floor bike storage. Access in and out of a 22-car street-level garage will be via an existing right of way on Hancock Street, they said. The public meeting is scheduled for Wed., Aug. 16, at 6 p.m. in the Cape Verdean Adult Day Care Center at 34 Hancock St.